It is the second day of action by the Right2Water group. THE RIGHT2WATER CAMPAIGN has said at least 90 demonstrations against water charges will take place this Saturday. These has been organised across the country, with over two dozen individual marches taking place in Dublin. The campaign, organised by trade unions, political parties, and community groups, is not calling for non-payment of water charges. Instead, the group is looking for a return to a water supply “based on need and not on ability to pay”. “The extent and diversity of the events being planned around the country not only by Right2Water, but also by other groups, reflects the level of public anger surrounding water charges,” a spokesperson said. 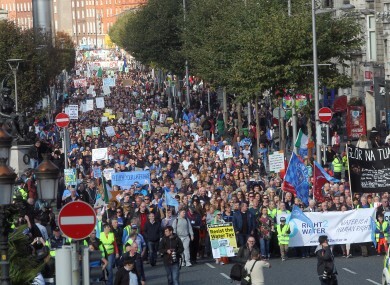 Right2Water was the main group behind a massive demonstration in Dublin earlier this month, where was many as 50,000 people took to the streets. Marches were held in Limerick, Cork, and Kerry against the charges on Tuesday, with RTÉ News putting the total attendance at 6,000. Email “Almost 100 anti-water charges protests planned across the country”. Feedback on “Almost 100 anti-water charges protests planned across the country”.